SPJ100 Fully Automatic Cartoning Machine applies to the encase packing of blisters, vials, cosmetics, poker and similar stuff. This machine can fold leaflet, open carton and insert stuff with leaflet into cartons, printing batch number and close carton automatically. This machine adopts horizontal configuration, PLC control system, photocell detector installed in each station enables stable running. Looking for ideal SPJ100 Fully Automatic Cartoning Machine Manufacturer & supplier ? We have a wide selection at great prices to help you get creative. All the Fully Automatic Cartoning Machine are quality guaranteed. 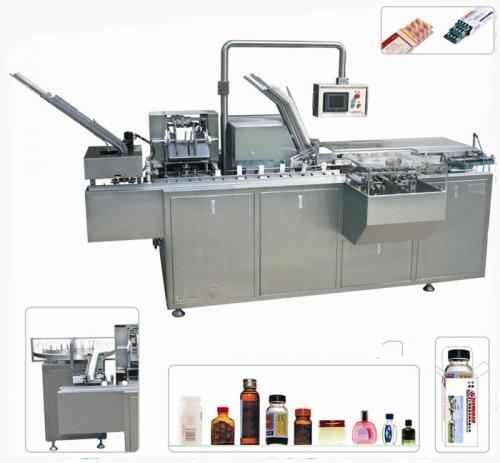 We are China Origin Factory of Fully Automatic Carton Packing Machine. If you have any question, please feel free to contact us.